Seriously steamy nights call for a hand fan, and moments like this capture the humid spring heat in rural South Florida, where the damp atmosphere swirls slowly and lays on you like your own personal cloud. This unusual moment reminds us of the languid romances of the deep south, from which it sometimes feels like Jupiter Farms is an escaped renegade, holding onto its southern roots while the rest of Palm Beach County adopts more modern and slick ways. Backyard weddings in Jupiter Farms often run late into the evening or even early morning, serious parties limited only by your distant neighbors (and only if you didn't invite them to join you) and perhaps a stray police cruiser. In reality not much will shut down a party of any size, so suggesting that your guests bring tents rather than drive home intoxicated is a perfect plan to ensure everyone wakes up safe and happy the next morning. 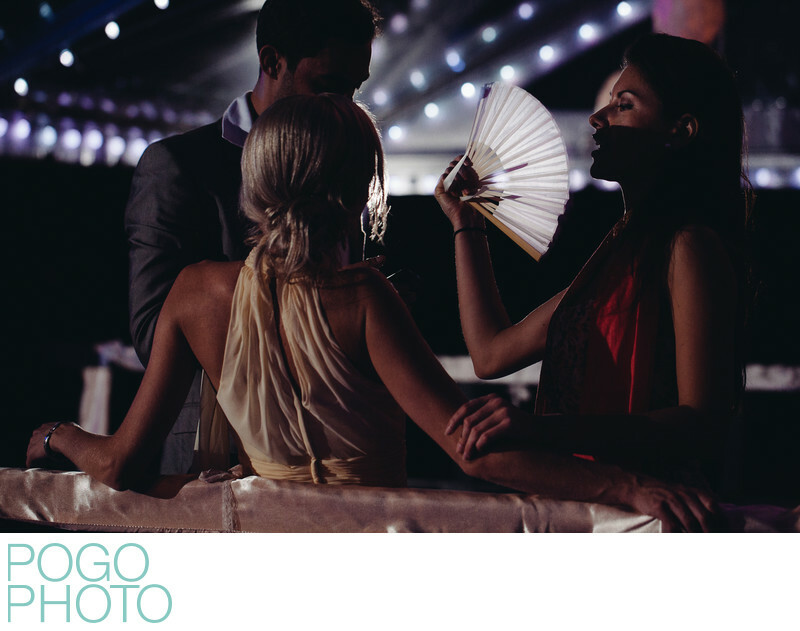 This dark and mysterious image is eye-catching because of the subtle lighting, the darkened primary colors of red, yellow, and blue, and the backlit fan, all drawing attention to the delicate touch on an arm, the soft fall of hair, parted lips, and closed eyes, drinking in the artificial breeze before hopping back on the dance floor to get hot and sweaty all over again.